Measurements: 2.43 x 3.93 inches; or 62 x 100 millimeters. Smallish. Back of card: Solid pale pinkish with three stems of leaves & flowers horizontally. Though it looks as if this deck could be inverted, if you see a green leaf in the upper right corner, the card's inverted. Sneaky. Booklet included: Yes, 32 pages, 2.3 x 3.8 inches, or 58 x 96 mm. Written by Christopher John Abbey. Comments: Suits: Swords are Flamingos, Wands are Peppermills, Cups are Hats, Pentacles are Oysters. A whimsical deck. Court cards are the usual King, Queen, Knight & Page. 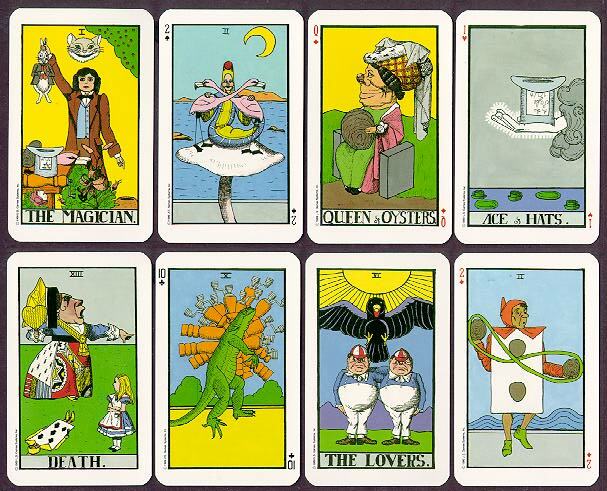 Some cards are based on Rider-Waite, some more obviously than others. The nine of Flamingos/Swords: A Tweedle at wits end, surrounded by 9 indifferent birds. The artwork is based on Sir John Tenniel's famous illustrations. "Lewis Carroll" is said to be a pseudonym for Charles Lutwidge Dodgson, a mathematician who was, as is well-known, a lover of small girls. He also photographed them. In some of his activities Mr. Dodgson was not, shall we say, politically correct, so we will pass on further comment. A magazine article we saw thirty years ago said a "computer analysis" had conclusively shown that Queen Victoria wrote the famous Alice books - which, if true, accounts for Charles's inability to write sequels. Which makes us wonder about the Queen, widowed in 1861. Research has shown she had a most interesting private life in her remaining decades. The first Alice book appeared in 1865, the second, 1872.